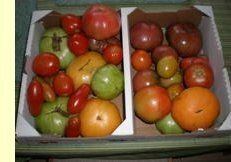 Heirloom tomatoes, peppers and more! Earn a free plant for every one of your referrals who purchase a plant from M R Gardens. Just tell your friend to let Megan know they heard about M R Gardens from you! While Megan's extended family are farmers, her inherited love of gardening and fascination with soil didn't emerge until graduate school. She designed her curriculum for her M.S. in Environmental Education from Lesley University to focus on sustainable agriculture. From 2001 to 2003, she visited many organic farms and volunteered at several permaculture farms across the nation. She also learned from growers trained in the Biointensive farming method, and put theory into practice at a 7-month apprenticeship at a Community Supported Agriculture in Pennsylvania. My neighbor tells me that we've passed both "dogwood winter" and "blackberry winter" (terms our ancestors used to describe spring frosts), so that means tomato planting season is just around the corner. Of course, as unpredictable as the weather has been lately, it's good to have a bucket or sheet (or better yet a small hoop house!) handy to put over the tomatoes in case we get a late frost. Here are the varieties of tomatoes and peppers that I currently have available. Note that the tomato plants are indeterminate, which means the plants climb up to 10 feet, so they need to be trellised and most likely suckered. Cherokee Purple is a variety originally from the Tennessee area that was cultivated by the Cherokees. The productive plants produce dusky rose to purple colored, 12 oz. - 1 lb. fruits. The tomato's rich, complex and sweet flavors make it a popular market variety. Oxheart produces large, deep pink heart-shaped fruits that have few seeds and a sweet, rich, complex flavor. The tomatoes are meaty while also juicy. The variety was originally brought over from Russia. Ruby Orr is a variety typically only found in Southwestern North Carolina. It is similar to German Johnsons in size and shape. It produces a meaty, flavorful, sometimes knotty fruit that turns pink with yellow shoulders when mature. It is excellent for BLTs. Yellow Roma is a unique variety that retains the great flavor of the Roma but has an exotic color. It is very productive all season. The thick wall of the small oblong Roma makes it the perfect tomato for home-canned salsa, sauces and catsup. Arkansas Traveler is a 100-year-old southern heirloom variety that produces well in hot weather, humidity or drought as it is highly resistant to cracking and disease. 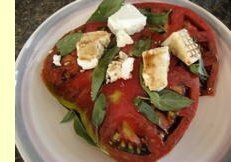 The smooth, rounded rose-colored tomatoes are 6-8 oz. and very flavorful and sweet. Sweet One Million Cherry produces high yields of super-sweet bite-size tomatoes that have excellent, hybrid disease resistance. The large vigorous plant has long chains of smooth, dark red, 1 to 1.5" fruits. It matures nicely and continues producing until frost. Gamba is a green bell pepper that turns red if left on the plant long enough. It excels as a frying or stuffing pepper. The thick, meaty flesh holds up well and sweetens during cooking. It produces flattened bells, 3" in diameter and 1.5" deep with rich red color. Golden Treasure is an Italian variety, excellent for frying, roasting and fresh eating. Long, 9" fruits ripen from green to shiny yellow. Sweet flavor with medium thick flesh and tender skin. Corno Di Taro is an Italian variety. The tall plant produces large amounts of narrow, slightly curved 8-10" long fruits. It is best roasted or fried. Sweet Big Red is a high yielding variety that produces a sweet, thick-fleshed bell that ripens green to red. Golden Summer is a yellow mild and sweet pepper with exceptionally thick walls. It starts out lime-green, then turns a sunny gold at maturity. Request a full plant list by emailing me (Megan) at gardens@wncmretc.com. M R Gardens sells on a sliding scale so that all people in the community can enjoy healthily grown plants. The M R Gardens plant wagon is typically open 10 a.m. - 2 p.m. in April and May. Email or call 828.333.4151 to request exact directions. In the case of inclement weather, please check the M R Gardens Facebook page to make sure the plant stand is open. Please note the wagon will not be open May 12. 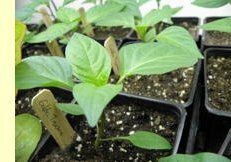 Read more about M R Gardens seedling sales. "What'd life be without homegrown tomatoes? That's true love & homegrown tomatoes..."
Three things come to mind when I think of tomatoes. 1) The lyrics to Ray Clark's song "Homegrown Tomatoes" (also covered by John Denver); 2) The taste of the first ripe heirloom tomato of the season, alongside mozzarella cheese, basil and balsamic vinaigrette, and sprinkled with pepper; and 3) Jean Taylor of Taylor's Greenhouse in Robbinsville, NC. I got to know Jean in 2010 while I managed the WNC Agricultural Options program. A woman of few words and a big heart, Jean epitomizes the unassuming yet proud nature of many farmers and gardeners I have met in the Appalachian Mountains. Her nursery tucked in the hills of Graham County attracts big crowds with just a few advertisements in the local newspapers. She told me about how a coveted tomato variety "didn’t last like a June frost" and about how "taird" she is by the close of nursery season in July. (I enjoyed hearing her Appalachian pronunciation, for in my family's rural Ohio speak, "taird" means really really tired.) Read the rest of the article. 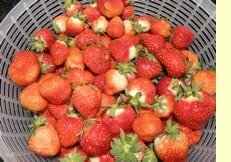 Baskets of strawberries and cut herbs are now available at M R Gardens. Pick the kinds of culinary herbs you need in whatever amounts you want. The following are currently available: thyme, oregano, rosemary, chives, and catmint (for tea). Sometimes it's nice to have someone beside you when you're undertaking something new, cheering you on, giving you confidence and answering your questions. Not to mention having good conversations and good fun in the soil. As your garden coach, I will help you set up a system that addresses your lifestyle, schedule, goals, personality and work style. I'll provide you a garden design specifically for you, as well as spreadsheets, timelines and growing tips to make your life in the garden manageable. Then I'll designate a few days your first season to work with you in the garden, where you can learn everything from how to best hold your body while working to when it's best to pick a pepper. Read more.